Bluefin tunas are among the ocean’s most fabulous fish. Sleek and strong, they cross oceans in mere weeks, warm their bodies by capturing their metabolic heat, and live for decades. They’re also prized commodities, especially as sushi in restaurants around the world. Given bluefin’s high cultural and economic value, overfishing has driven some populations of these prized ocean predators into steep decline. How to rebuild bluefin populations remains a critical question — one science can help us answer. 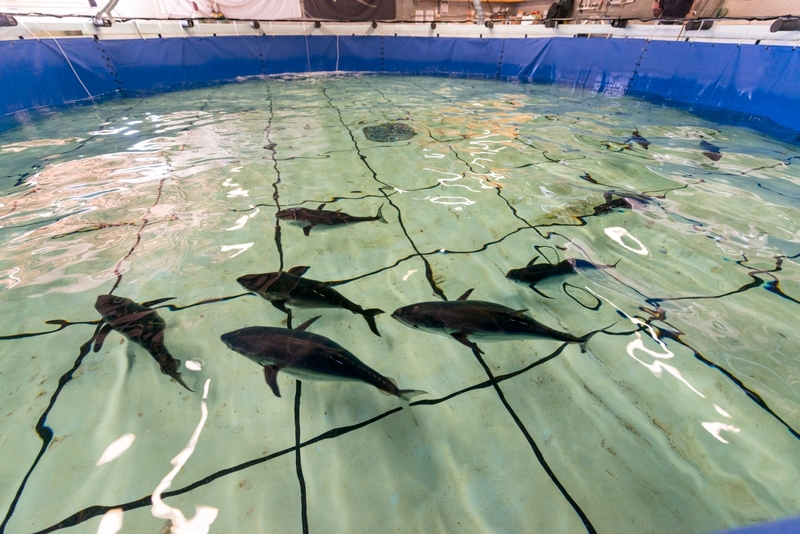 Tuna swim in a flume, also known as a “tuna treadmill,” at the Tuna Research and Conservation Center. Researchers and fisheries managers around the world are working to protect and recover bluefin tuna populations. But conservation efforts must be informed by basic science: When do bluefin mature? Where do they travel in the ocean? When do they stop to eat? From Jan. 18-20, Monterey Bay Aquarium and Stanford University will convene the world’s top bluefin researchers, policy makers and stakeholders to share cutting-edge data and new approaches to conserving these iconic species. Together, they’ll look to identify areas for international collaboration. 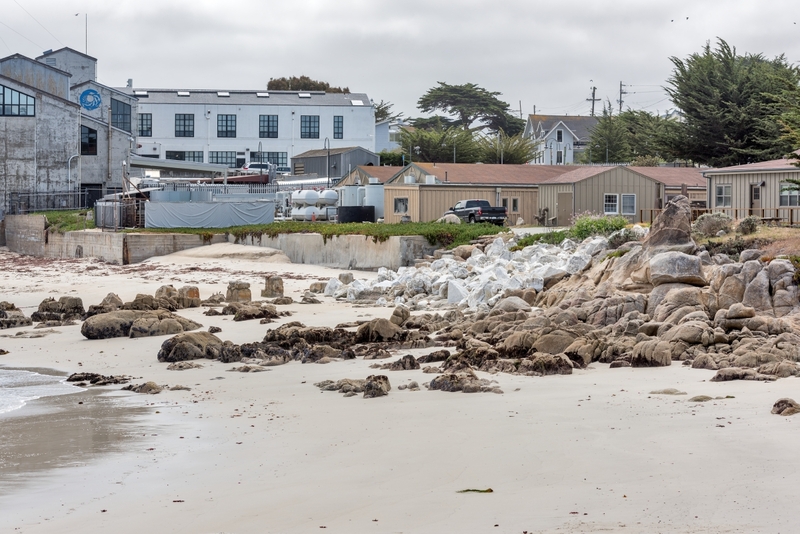 The Tuna Research and Conservation Center is a partnership between Monterey Bay Aquarium and Stanford University. The upcoming meeting is the brainchild of Stanford University professor Barbara Block, who’s devoted her research career to the hows and whys of bluefin tunas. It also reflects three decades of collaboration between Barbara and Chuck Farwell, the Aquarium’s Tuna Research and Conservation Manager. In 1993, Barbara was recruited to Stanford from the University of Chicago. During the visit, she and Chuck hatched a plan to join forces and build a tuna facility at Stanford: the Tuna Research and Conservation Center (TRCC). They hoped to jointly accomplish two missions: to help the Aquarium exhibit tunas, and to start a research facility specializing in the biology of these Olympic-caliber athletes. For more than 20 years, the TRCC team has focused on big-picture tuna challenges. First up was learning how to keep yellowfin and bluefin tunas in captivity — research that eventually enabled the Aquarium to display the sleek predators in the Open Sea exhibit. Tuna in a TRCC tank. In 1996, the TRCC team began asking where tunas go in the wild. Barbara had worked with the father of tuna biology, Dr. Frank Carey (to whom the TRCC lab is dedicated), to track tunas with telemetry. Using tracking technology, the team has explored questions of where tunas travel in the ocean and how their bodies handle the extreme conditions they face on their migrations — between continents, from subtropical to temperate waters, and to depths of more than 6,000 feet. Their findings are helping inform conservation practices that could help bluefin tuna populations recover in years to come. The TRCC team has mapped the migrations of hundreds of Pacific bluefin tuna. The TRCC team’s research has been especially challenging and transformative for one reason: It’s difficult to understand where animals go, and what they do, when they’re underwater and far from shore. Using the “fish and chips” strategy, TRCC scientists have uncovered critical information about where tunas travel. In the early 2000s, they documented tunas making transoceanic journeys. Some of the bluefin born in Japan travel to the California coast, and some born in the Gulf of Mexico travel to the European coast. The discovery of these fishes’ highly migratory behavior has greatly improved our understanding of all three bluefin species, and informs international negotiations on conserving bluefin tuna populations. Other studies have uncovered where bluefin tunas eat and where they spawn — two crucial bits of information when it comes to protecting them and essential tuna habitats. A recent paper in the journal Science Advances identified key bluefin tuna feeding locations in the Pacific, and determined they prefer searching for food in specific conditions. 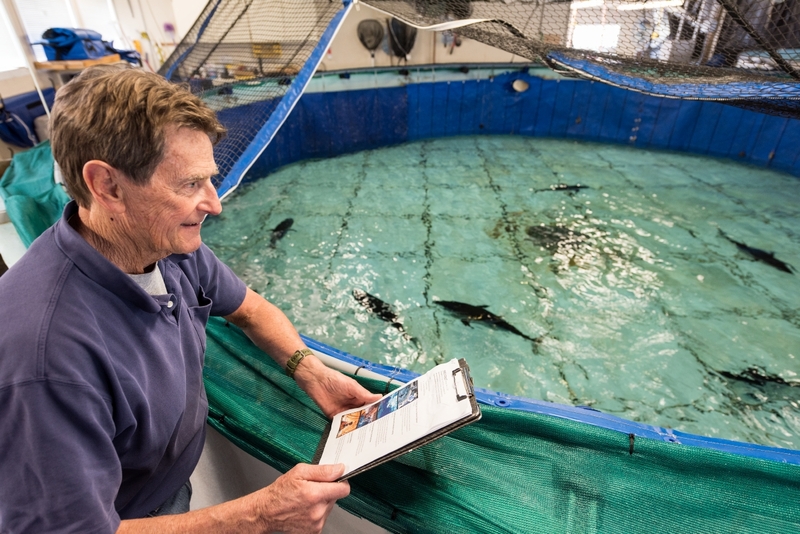 Chuck Farwell checks in on fish at the Tuna Research and Conservation Center. In collaboration with tuna researchers in Japan, Chuck and the TRCC have been working in the Sea of Japan to find out where Pacific bluefin spawn, and what habitat the young fish utilize as they develop. Their work should be published later this year. The TRCC team is making important discoveries about bluefin physiology, too. Unlike most fishes, tuna are warm-blooded, or “endothermic,” meaning they can heat their bodies above the temperature of the surrounding ocean. But not every body part gets warmed equally. Bluefin maintain heat in their eyes, brain, swimming muscles and guts. But their hearts are cold, experiencing temperature drops of tens of degrees Celsius during deep dives. How do tuna manage to keep their hearts pumping at temperatures that would stop a human heart? 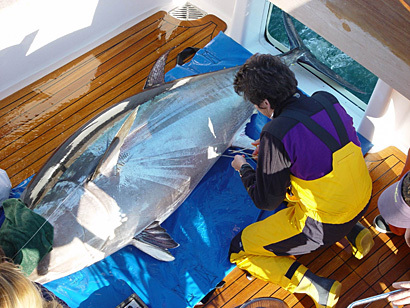 Barbara Block and other TRCC researchers have perfected the art of tagging giant bluefin tuna at sea. In 2015, Barbara and colleagues published a paper in the Proceedings of the Royal Society of London B that answered this question. They found that adrenaline was the secret. Cold temperatures trigger an adrenaline rush, which helps maintain the level of calcium in tuna hearts. Without calcium, the heart would not be able to beat normally at extremely cold temperatures. In May, Barbara will receive the 2016 Peter Benchley Ocean Award for Excellence in Science. The award is just one of several she has earned over the past two decades — including a MacArthur Foundation “genius grant” — but her tireless work is far from finished. There are still hundreds of questions to be answered, more bluefin to track, and populations to preserve. Illustration of an Atlantic bluefin tuna – one of three bluefin tuna species, along with southern and Pacific. By tagging bluefin tuna in the wild and learning more about their physiology in captivity, the TRCC team is producing data crucial to sustainable management. Barbara hopes that by bringing together global scientists, fishers, managers and policymakers, we can ensure that collaboration increases, transfer of knowledge improves, and the steep decline of bluefin populations in the Pacific and the western Atlantic reverses in her lifetime. Chuck has high hopes the Bluefin Futures Symposium will bring the science to bear on management solutions. “Everyone at the Aquarium that’s involved in this has high expectations there will be positive outcomes,” he says. Learn more about the Bluefin Futures Symposium at www.bluefinfutures2016.org. Featured photo: Dr. Barbara Block was honored in the Rolex Awards for Enterprise in 2012. Photo by Rolex. Enter your email address to follow this blog & be notified of new posts by email.